Automating these steps would be useful to give us a quick initial view of a client network. Allowing us more time for more manual validation steps. Next to this we can use this to standardize some of the pentesters workflow to make sure all team members perform the same baseline checks. 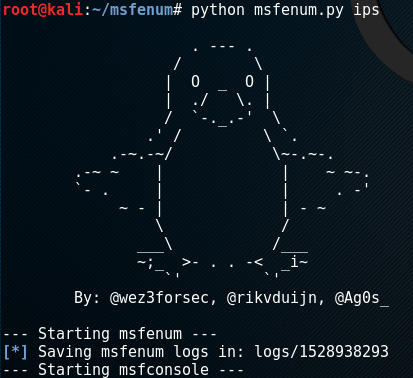 Metasploit makes it pretty easy to run those auxiliary modules, however I was looking for a way to make this even faster (plug into the network and run all the modules). I was thinking about writing a tool to automate this, which only needs an IP-range to be scanned. I shared my idea with @rikvduijn, he got pretty enthusiastic about the idea. He got an idea on how to structure this tool and started writing the skeleton the same night :-). There is a config file present. Here the modules you like to add can be defined in the “modules” entry. After adding it to the config file, a module file needs to be created in the “modules/” folder. Create a new file with the name of the modules (value after the last “/”, e.g. smb_version). Add the specific RC commands to run for your newly added module. That’s it. The module is added. The modules system was created in the hope, other people, with useful auxiliary scans can commit the useful scans back on the Github page. This way, we can help each other to improve (internal) penetration tests :-).